Our basement rental apartment is really starting to come together. Unfortunately I did not get a lot of before pictures of the kitchen, but in a nut shell, it was a concrete room. Here is a great example of us having either the money or the time. We did not have ten thousand dollars to put in a new kitchen, especially in a rental unit. 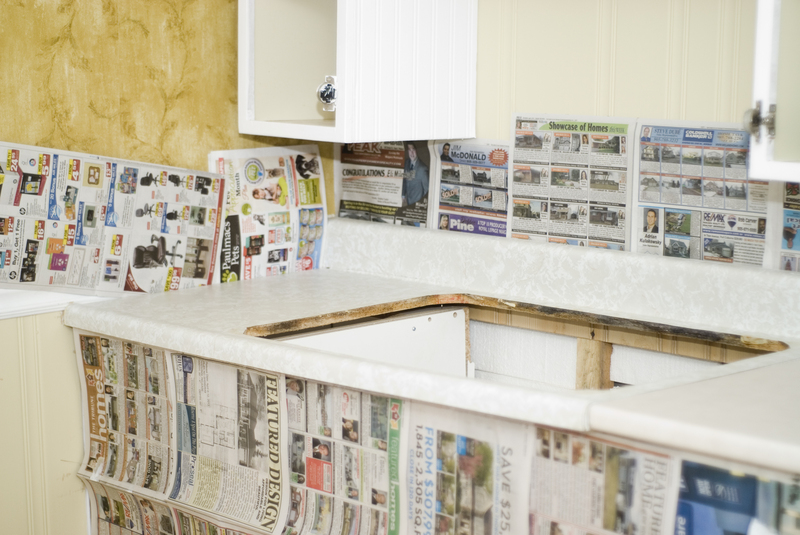 Our alternative….rebuild something old for cheap! In the end the entire kitchen cost us just over $500. I wish that I had kept a complete tally of everything that we spent money on, but I can tell you that all of the cupboards, countertop, sink and taps cost us $110. 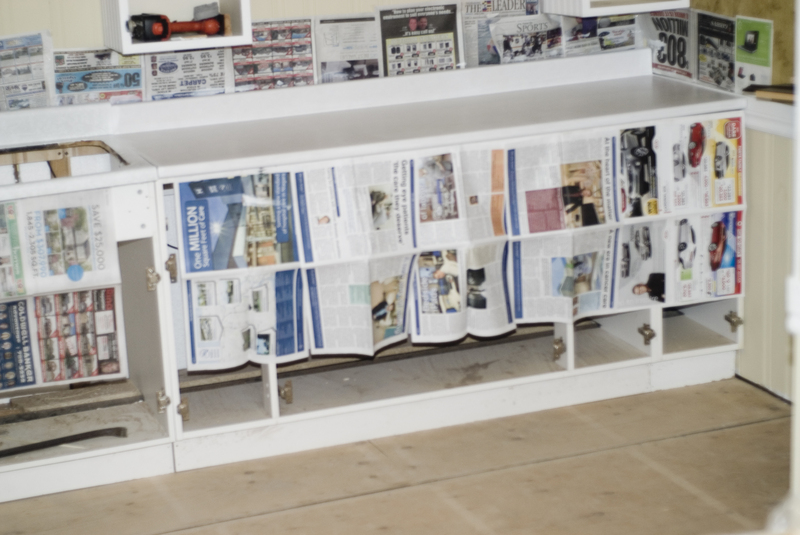 Remember these melamine cabinets that were all the rage in the 80’s? Again, I am sorry now that I didn’t take pictures of the process, but I scrubbed them down, put bead board wall paper on the fronts, added a thin piece of wood around the edges, filled in the holes, sanded, filled in the holes again, then primed and painted them a million times. 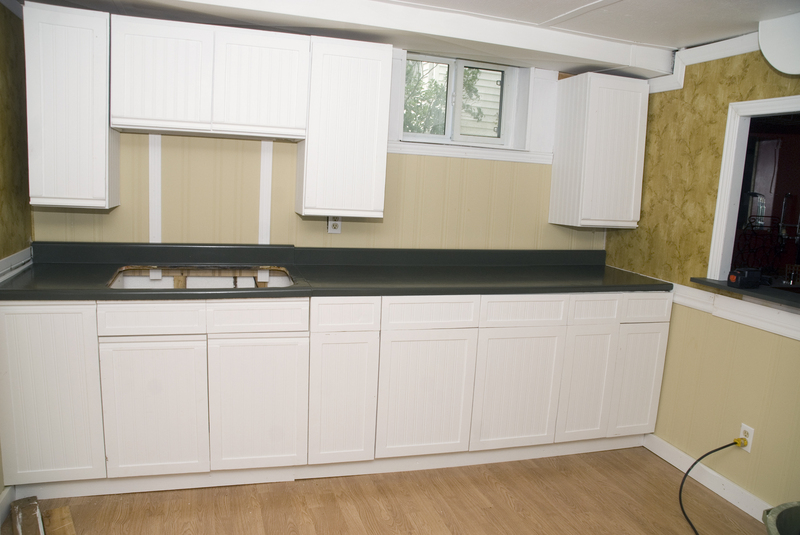 I also added the bead board wallpaper to the outsides for the cabinets on the sides. 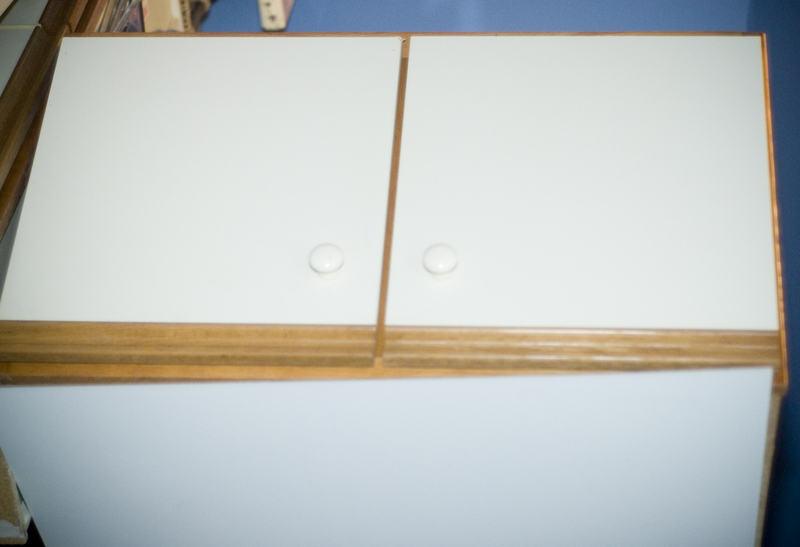 As for the counter top (which is actually two counter tops) I sanded them, primed them and painted them. After about 5 coats of paint, I put 8 coats of clear coat to protect them. We built up the floor (remember, it was all concrete) with plywood so that it wouldn’t be as cold and put down laminate wood flooring…..which we got for FREE!! Today, I finally got some new pictures of how it is coming along. The cupboards are back on, the counter top is complete and the flooring is down. The cupboard doors are a little shifty, so we need to fix that, then clear coat them and add the hardware! From those to these!!! It took me something like 50 hours, but i was totally worth it! I absolutely love them! 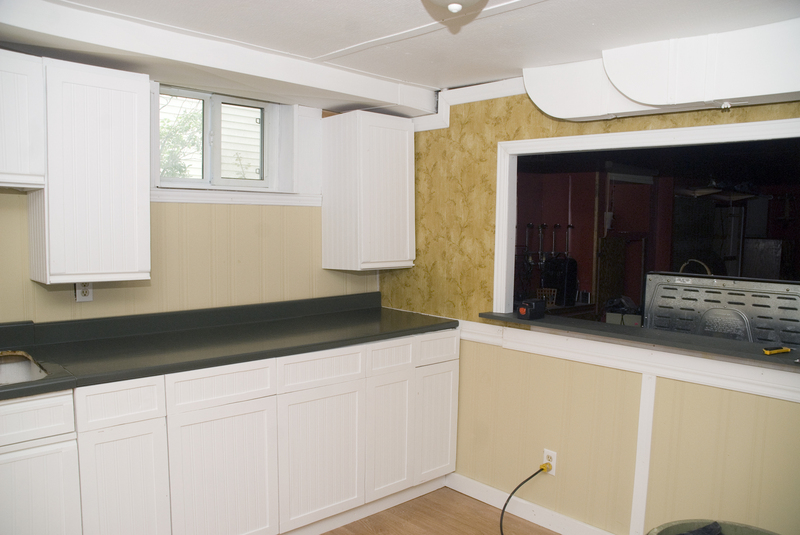 Kitchen Renovation – More time = LESS money! Great job! I love beadboard. 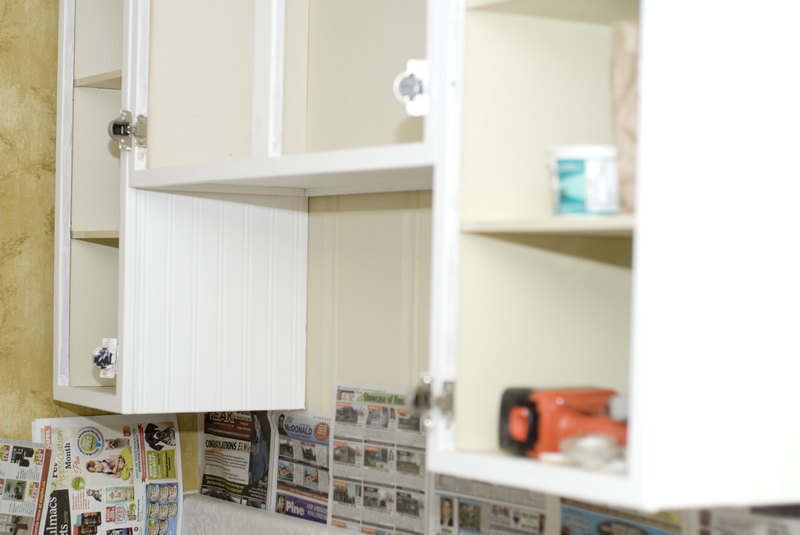 And from experience (and all that paint) your counters should last forever!. Well that it good to know!I am going to put a big cutting board on the counter top for the workspace as well to try and prolong the paint! That’s smart to have a cutting board . Now you just have to hope everyone actually uses it!! Please keep posting about your kitchen and thanks for following! Hi, I’m glad I found your blog! 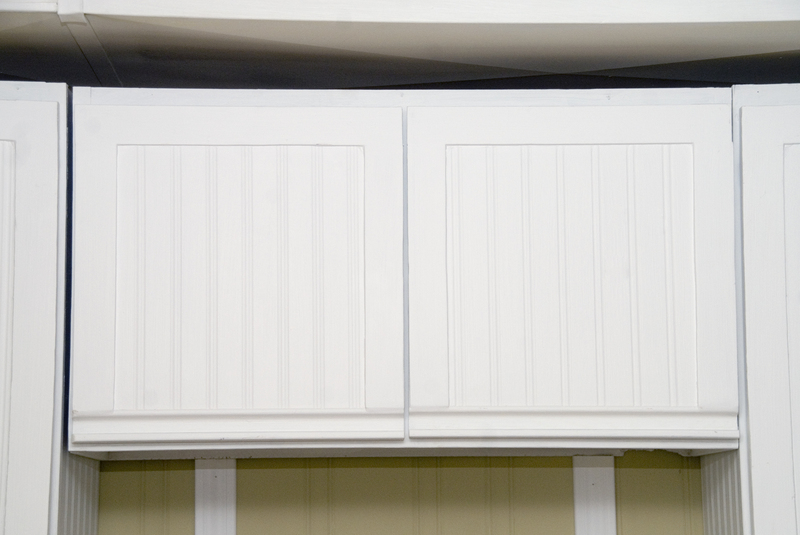 I just bought a house with the same kitchen cabinets – they are awful – and was planning on doing something similar with them. 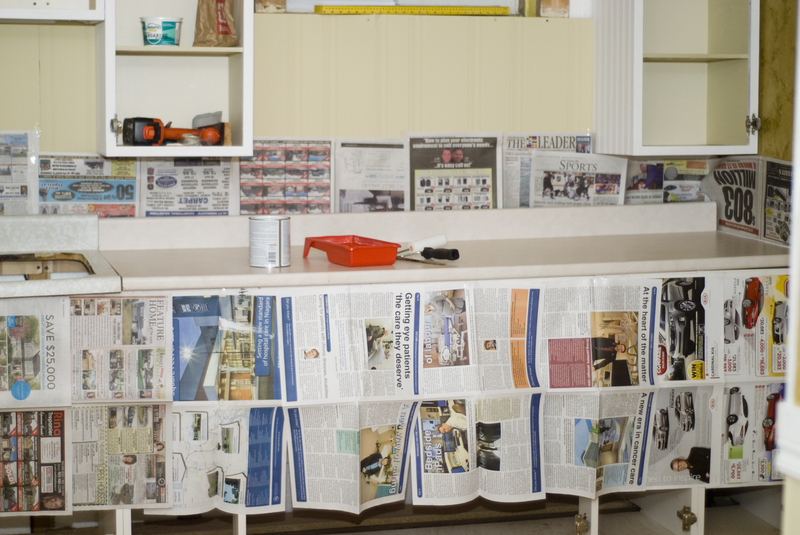 Did you use anything to seal the paint and wallpaper on the cabinets? How have they been holding up since you finished? First thing I did was sand the cupboards lightly to take off any grim and to create small scratches that the wallpaper would be able to stick to. I just stuck the wallpaper onto the cupboards with water. It had the glue on the back. Then I screwed small strips of wood to the edges. Next I used drywall compound to fill in the screw holes and the cracks around the wood strips. Let dry and sand, then prime the whole thing. Prime again, then paint the desired colour. I used a coat of varathane on them for the extra durability. They are holding up very well! 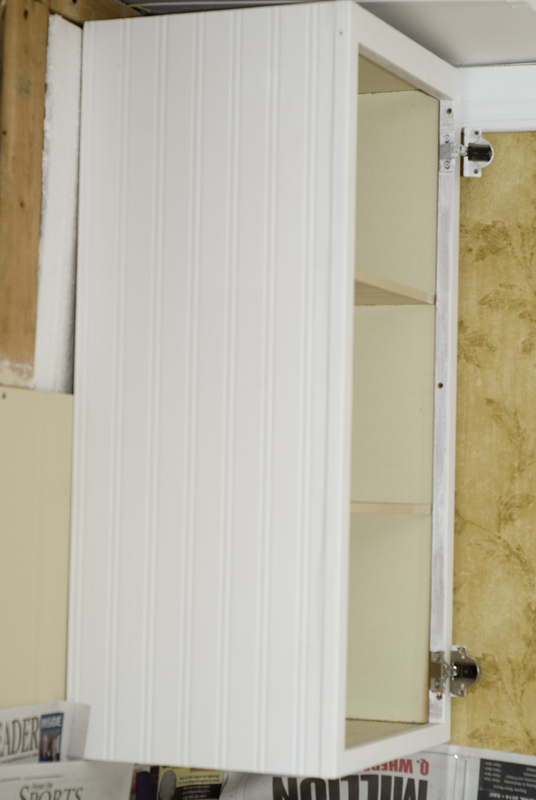 I was wondering how you did the cabinets where there is only three pieces of trim (the top ones). My dad and I are planning to do this for my kitchen (I have the exact same cabinets). He was wondering did you fold the wallpaper under the lip or did you cut it slightly above where the lip starts ? I’m really impressed and cannot wait to do this. I think I cut it slightly above the lip. It seems to long ago, I cannot remember. 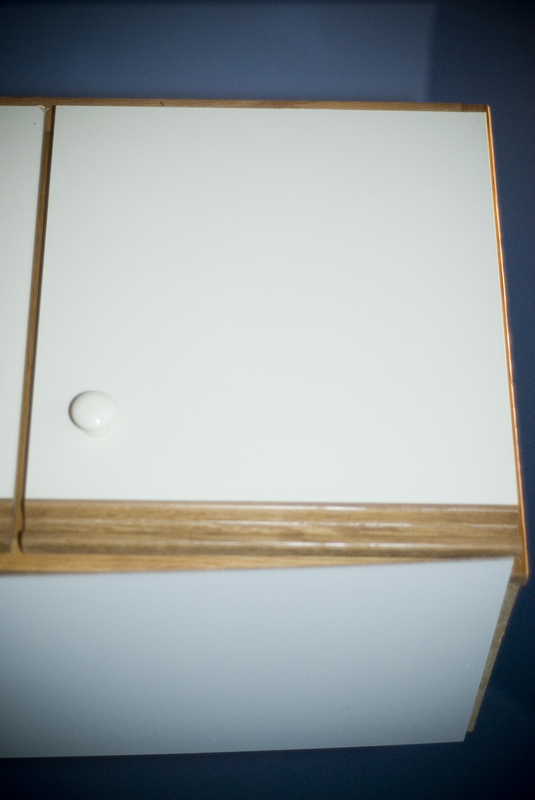 That piece of wood that is already on the cupboards is a pain, but once everything is painted, it is really hard to see the imperfections!! Dusting off the old camera! The House Appraisal – Will our value go up? A cherry break from yard work!! Such a cutie!! Looking forward to our next dinner date!! That time of year!! Rhubarb and strawberries!! A self made Indian woman. Addicted to DIY! A Free home design & lifestyle magazine to Inspire your creative side!